Despite the cold weather starting to kick in, the trout are still up in the water and the fishing is still good. Buzzers are still coming off the water and the trout are still smashing the fry. 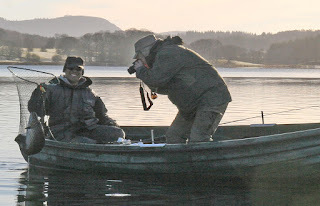 Best trout recently reported was a 7lb brownie which was caught by Mark Stow from Ulverston. Mark was Pike fishing and accidently hooked the Trout on a Pike lure. The fish was taken from the car park area of the lake from a boat. Novice angler Dave Almond from Wigan fished spinner from the boats and landed a brace of rainbows to 3lb. Meanwhile also fishing from the boats was Stuart Carruth from Glasgow. Stuart employed a cormorant fly on an intermediate line to catch and safely release 3 Brown Trout to 1lb 8oz. Hawkshead Angling Club member Dave Bell has had a couple of productive bank sessions fishing legered worm. Dave landed 2 rainbows and 4 brownies to 2lb+. Both bank and boat anglers are reporting some quality fish. Hawkshead Angling Club member Tim Carswell fished static deadbait from the bank and landed an 8lb and a 16lb Pike respectively! Geoff Birtwistle from Bury fished from the boats and landed a cracking 19lb 8oz beauty on static deadbait. Meanwhile Big s club member John Ashurst from Wigan caught an 18lb, 20lb 8oz a 21lb and a 22lb Pike. All fish were caught from the boat on static deadbaits and lures. Mark Billington from Sedbergh employed David Coleman on a guided Pike fishing trip and landed a mint 25lb predator on static mackerel deadbait. Mark also lost another big fish at the net to complete another successful trip out on Esthwaite Water. (see attached photo ). One of the largest Pike to be caught on rod and line in the UK was reported to fisheries staff last week. Jeff Dandy from Barrow in Furness was fishing from the boats with his mate and landed a huge 46lb 1oz Pike, on static Roach deadbait. Unfortunately the pair could not give a picture as they didn’t have a camera with them. Fisheries staff have checked Jeff’s set of digital scales and they were found to be accurate. On the coarse fishing front venue regular Martin Winward from Barrow in Furness fished maggot on the tip and reported a nice bag of Roach, tipping the scales at 27lb! For up to the minute information please telephone the ticket office on 015394 36541 or find us on Facebook or follow us on Twitter!